Whether your preferred sleeping position is on your side, back or stomach, this Beautyrest bed pillow helps you get a good nights sleep. The 100 percent latex pillow offers extra firm support, while the 250 thread count, sateen zipper cover gives you an extra soft touch allowing you to sleep comfortably. The natural latex is made from the tropical rubber tree and provides built-in antimicrobial properties. The latex features a cell structure that bounces back, so your head and neck are always supported. Sleep peacefully with a Beautyrest Latex foam bed pillow. Make your bedroom extra cozy with a soft latex pillow. The Beautyrest Latex Pillow Standard Size (2 Pack) has many exciting features for users of all types. 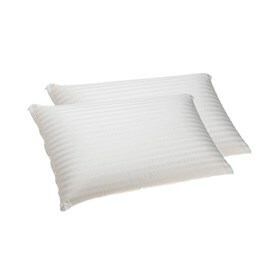 See the Beautyrest Latex Pillow Standard Size (2 Pack) gallery images above for more product views. The Beautyrest Latex Pillow Standard Size (2 Pack) is sold as a Brand New Unopened Item.